White double glazed security entrance door and matching windows to front, smooth plastered ceiling and walls, coving, all painted in neutral colours. Stairs lead to first floor, double radiator, full height cloaks cupboard, inset lighting, various power points, wood effect laminate flooring. White double glazed window to side, smooth plastered ceiling and part tiled walls all in neutral colours. White suite comprises: low level WC, pedestal wash hand basin with chrome taps, radiator, inset lighting, laminate flooring. White double glazed bay window to front, smooth plastered and coved ceiling, smooth plastered walls all painted in neutral colours. Feature Stone Fireplace with inset gas fire, double radiator, inset lighting, various power points, television aerial point, neutral coloured carpet. Double glazed window to rear, radiator, smooth plastered and coved ceiling, smooth plastered walls all painted in neutral colours, ceiling light point currently with feature drop pendant lighting over the dining table, various power points, radiator, double opening doors to the Lounge. This L Shaped room has a Fantastic High Vaulted polycarbonate ceiling and roof openers (see the photographs). Lots of space for lounge furniture and also a generous size Hot Tub which could be removed if required to give more substantial living space. Double glazed windows and doors to rear garden, part plastered / part exposed natural brick, ceiling and wall lighting, bracket for wall mounted television, feature gas effect log burner, tiled flooring with partial under floor heating, various power points. Double glazed windows and doors to rear garden, wall lighting, tiled flooring (additional tiles are available if the Hot Tub is to be removed). Hot tub with all the usual blower / lighting features. Various power points. Door giving access from Conservatory, Pitched glazed roof, marble walls to all sides, shower and drainage, tiled flooring, heated towel rail. Double glazed windows to rear and double glazed door to side. Smooth plastered ceiling and walls all painted in neutral colours, feature inset lighting. Range of Modern fitted units at both base and eye level, one and a half bowl “Porcelain” sink unit with chrome mixer tap inset to “Quartz” work surface with matching upstand and feature coloured splash back. Four ring Bosch hob with extractor fan above, Bosch eye level stainless steel / glass double oven, integrated Bosch dishwasher, integrated fridge/ freezer, various power points, wood effect laminate flooring. Double glazed double opening doors to Conservatory, smooth plastered ceiling and walls all painted in neutral colours, feature lighting, modern designer style low level grey coloured radiator, various power points, space for table and chairs and other large furniture, wood effect laminate flooring. Wall mounted television point. Panelled doors to Dining Room and Hallway. Smooth plastered ceiling and walls all painted in neutral colours. Range of base and eye level units, stainless steel single drainer sink unit inset to roll top work surface, space and plumbing for washing machine. Wall mounted Boiler serves hot water and central heating systems, heated towel rail, wood effect laminate flooring, extractor fan, various power points. White double glazed oriel bay window to front, smooth plastered and coved ceiling and smooth plastered walls all painted in neutral colours, radiator, various power points. Plastered and coved ceiling, smooth plastered walls all painted in neutral colours, cupboard housing hot water cylinder and space for airing, various power points. Superb, Feature shaped double glazed window to front, high vaulted plastered ceiling with ceiling light fan and inset lighting, smooth plastered walls with wall lighting and mounting for television, radiator, various power points, neutral coloured carpet, open arch to Dressing Area. White double glazed window with opaque inserts to rear. Plastered ceiling and walls all painted in neutral colours with tiling to wet areas. 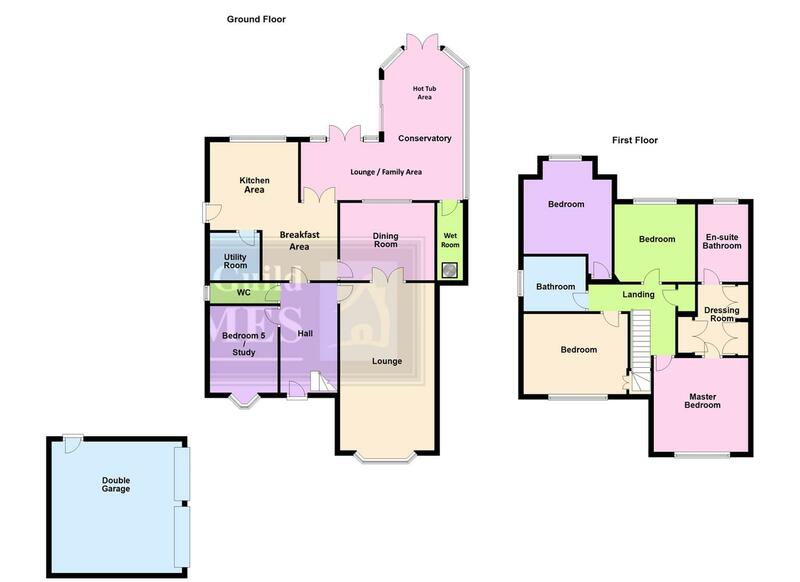 White suite comprises: panelled bath with mixer tap and shower attachment, low level WC, pedestal wash basin, separate tiled shower cubicle with folding glazed entry doors and electric shower, extractor fan, radiator. Double glazed window to rear, plastered ceiling and walls all painted in neutral colours, radiator, various power points, neutral coloured carpet. Double glazed window to front, plastered ceiling and walls all painted in neutral colours, large storage cupboard, radiator, textured ceiling, power points. Double glazed window to side, Smooth plastered ceiling, waterproof panelling to walls. Luxury suite comprises: large walk in double shower cubicle with glazed courtesy screen , built-in bathroom furniture with low level WC, wash basin inset with cupboard below, heated chrome towel radiator, inset lighting, extractor fan. Good size frontage and double garage allows multiple off street parking, Mostly hardstanding with established natural screened borders. additional space to side of garage. Dual up and over doors to front, power and lighting connected, pitched roof allowing storage space. Commences with decked patio with inset lighting, then mainly laid to lawn with established beds and borders, outside security lighting, outside tap, gate provides side access to front.